For 30 years Gillette had the slogan, ‘The best a man can get’ and recently changed it to ‘the best men can be’ for their latest campaign. Essentially, the ad encourages the viewers to set good examples for the future generation of boys. However, the backlash came when viewers (mostly men) felt as though they were targeted as being the problem in society. With comments on their YouTube channel along the lines of “January 2019, Gillette declared war on all men,” viewers felt as though the message should be potent rather than generalising all men and boys. There are also many that are praising the ad outlining the fact that it addresses an important issue, especially in the wake of the #metoo movement. Many feel the ad is a healthy message for men to move forward and take responsibility for their actions, each other's and the future generations' as some day a boy will become a man. Despite the backlash the ad has received, it has gained a considerable number of comments and conversation. 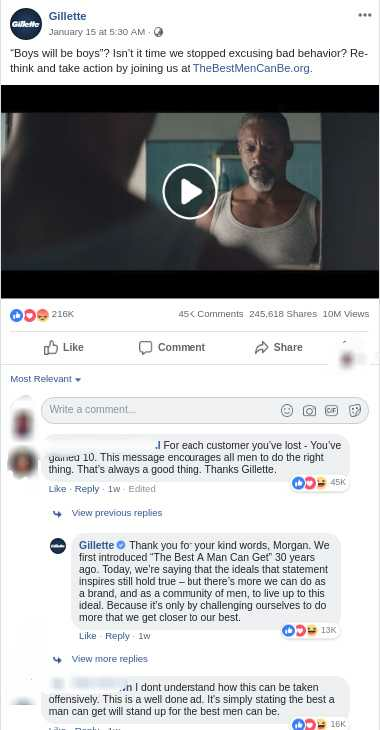 Gillette is still making efforts to engage with their audience by replying regardless of it being either positive or negative. The internet exists under an attention economy and keeping this in mind, the advertisement is a success. Prior to this ad Gillette has zero mentions on Facebook in New Zealand, Since the airing of their toxic masculinity ad, there has been over 200 specific mentions to their name. In the past 12 days since it was published to YouTube, it has received over 25 million views. It’s no doubt that it’s roughed the feathers of a lot on individuals worldwide with YouTube dislikes at 75%.The video on Gillette’s Facebook page has been shared 245,000 times in 12 days, which doesn't include the re-shares; just imagine the reach! Here at Zavy, we found that shares hold the strongest correlation to ROI and the content that attracts the most shares. Regardless of if you agree or disagree with Gillette's PR advertisement, its messaging has struck internet sensation gold. People are talking about them. They may have lost customers, but in return, they are gaining new ones and strengthening the brand loyalty for people that believe in the message. Let us know what you think of the ad! And while you're here, why not check out how your own brand is doing on the social scoreboards?